In the two previous related posts (here and here), I showed you how to setup and configure AutoSPInstaller to automate your SharePoint installation. So now, we get to see the fruits of our labor. In this post, I’ll share the screenshots based on those configurations. You could use these to see what’s supposed to happen and perhaps adjust your settings so AutoSPInstaller completes. 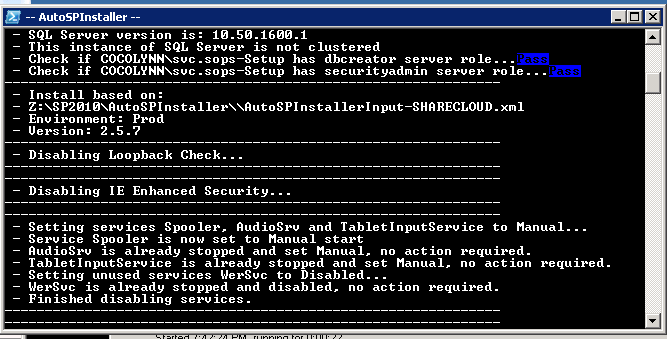 For the most part, AutoSPInstaller has good error handling and will let you know what’s failed. Many of the errors are simply what you’d get if you run the PowerShell equivalent of whatever the current process is. Some of these errors are not descriptive or could lead you down the wrong path (for example, "could not contact server" when you just have incorrect credentials). Here, you’ll note AutoSPInstaller has started a transcript/log. Take note of the location (the desktop by default). It’s also validating your accounts to prevent errors later on. And, its creating your SQL alias if you specified one. Some more pre-checks here for SQL Server permissions as well as using the correct XML configuration file. I specified disabling services so it does that up front. This is the prerequisite installer kicking off. Depending on your security policy, you may get a prompt to allow/trust the installer to run. I explained in my previous post how to allow it without a prompt. 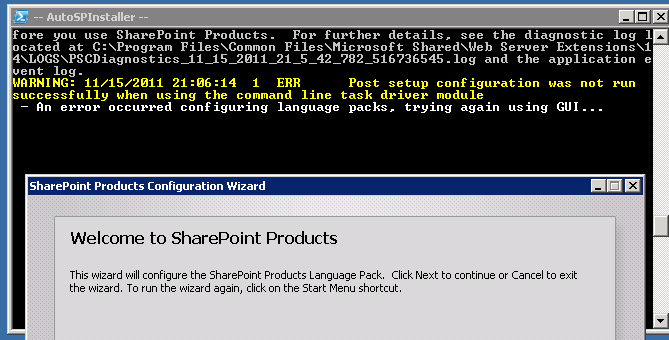 After IIS logging is configured, SharePoint installation starts. Next, Office Web Apps are installed and so are any language packs we specified. There’s also the TaxonomyPicker.ascx fix, a very annoying event log entry if you don’t do this. Also note, we’re adding our Farm account to the local Administrators at this point. Ignore the "Local farm is not accessible." warning, it’s not accessible because it doesn’t exist; AutoSPInstaller continues joining the farm. Here, we’re creating the Central Admin site as well. I enabled SSL on it so it will assign a certificate. The certificate handling is excellent. Note that it didn’t find one, so its creating a new self-signed certificate. We also configure ULS at this point. This is where we start to configure language packs. Basically, we’re running PSCONFIG. So, AutoSPInstaller launches the GUI (PSCONFIGUI). Just hit next. 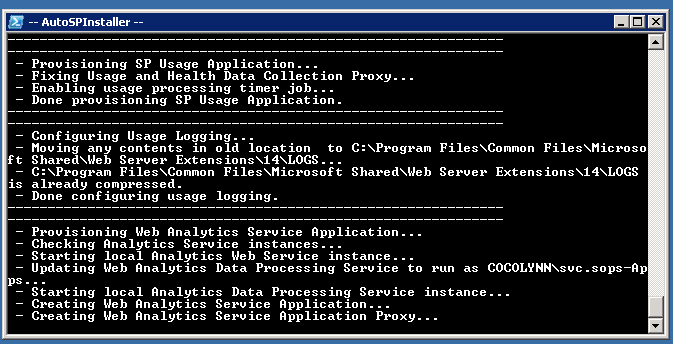 It will ask if its OK to stop some services, press Yes and the install will continue in GUI. After it completes, you’ll have to hit Finish. We simply add managed accounts here and start creating the Web Applications. From the above screenshot, you can see that AutoSPInstaller is doing some cool things while creating our Web Apps. 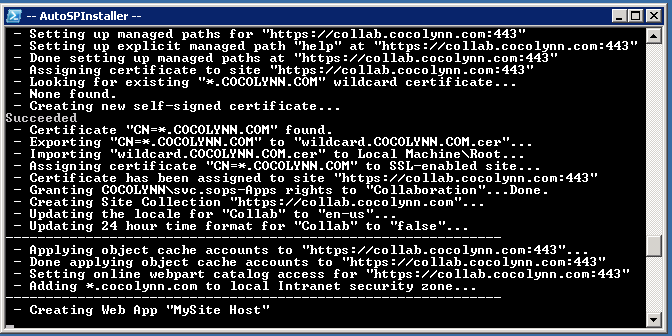 It includes setting up managed paths, SSL certificate assignment, setting locale and time format, applying the object cache accounts, etc. Doing all of this manually or even with PowerShell, would be quite tedious. 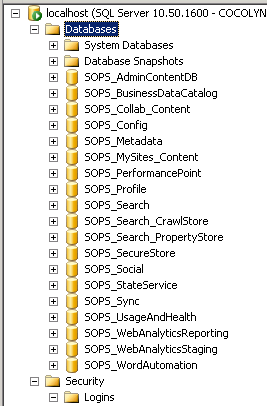 After the Web Apps are created, including the MySite host, we start provisioning some Service Applications. More Service Applications, including properly provisioning the User Profile Service. This part could take some time, just wait. The most common cause for this taking too long is that the server doesn’t have sufficient resources (at least 2 vCPU and 8GB of RAM). Even more Service Applications here as well as Usage Logging. Continuing Usage Logging configuration and starting Web Analytics. 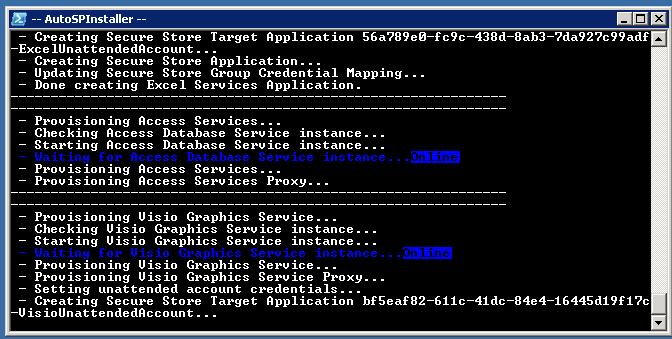 Creating and configuring Secure Store â€“ doing this manually is really a pain, especially setting up the keys. We’re also adding our Service Application account to some built-in Windows groups. 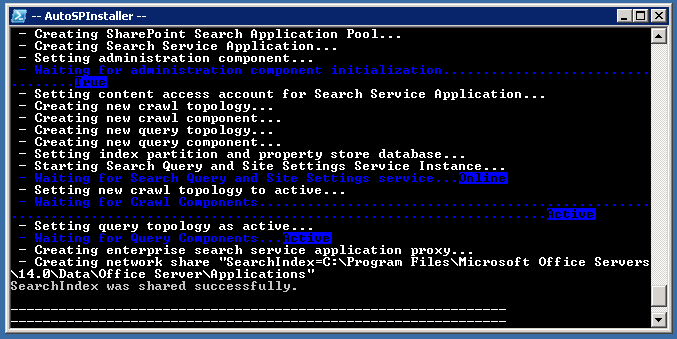 Provisioning Enterprise Search and all of its components plus configuring the actual search topology. This could also take some time, be patient. A bunch more Service Applications including BDC and Excel Services. Some of the Excel Services configuration is done for us, such as setting the unattended account credentials and adding your "Portal" Web Application as a trusted source. 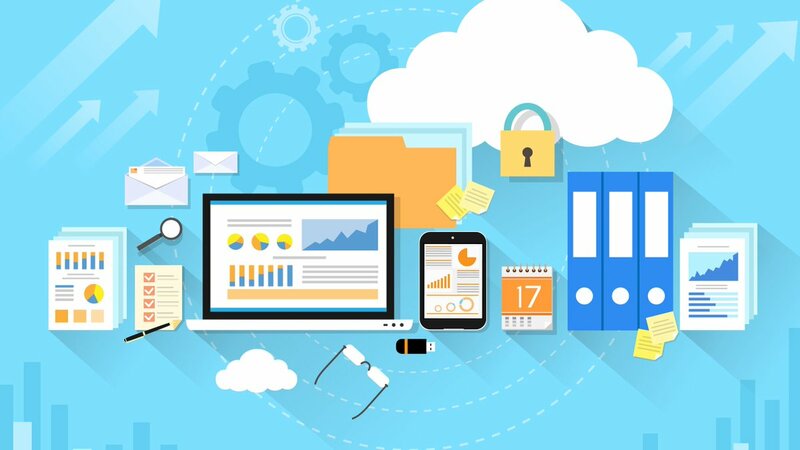 More Enterprise Service Applications being provisioned such as Access and Visio services. More Service Applications, including PerformancePoint, Word Automation and PowerPoint services. 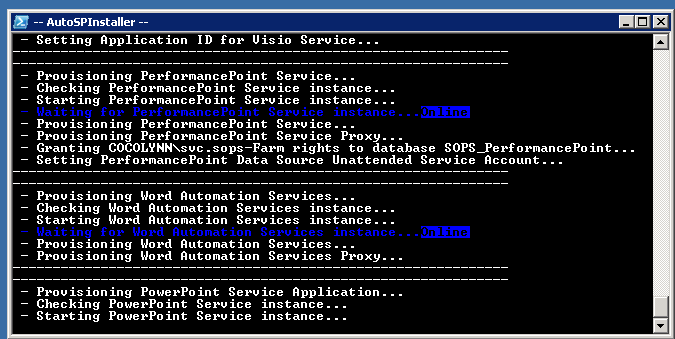 Note that the script also gives the Farm account the proper permissions to the PerformancePoint database, which isn’t done by default when manually provisioning via PowerShell. 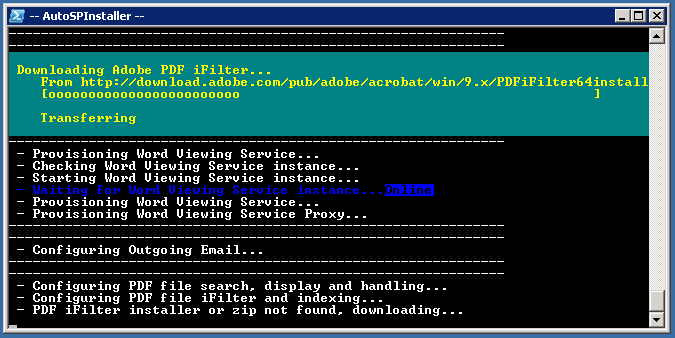 Here you can see that Outgoing Email is configured and we start configuring Adobe PDF iFilter. Since the installer wasn’t present, AutoSPInstaller will download it for me. Still transferring. The script uses BITS protocol for the transfer. 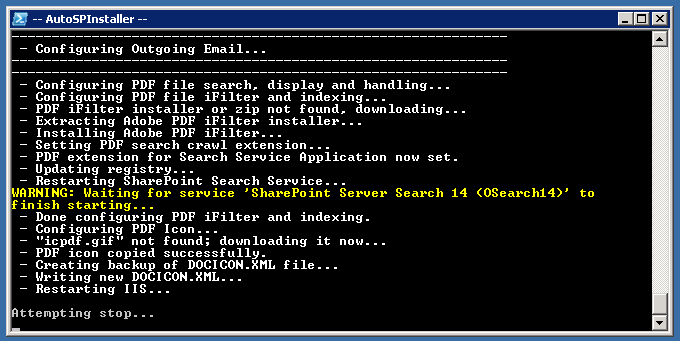 All done with the PDF iFilter, several configuration steps are completed, including renaming the icon and modifying SharePoint’s DOCICON.XML file. 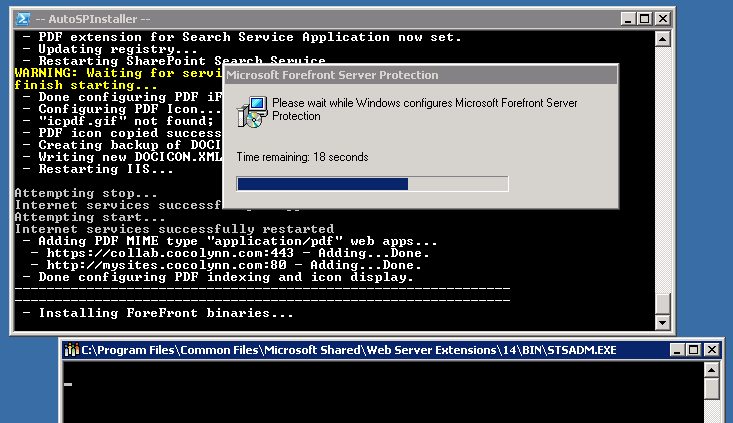 After an IIS restart, it’s time to install Forefront Protection for SharePoint. Notice the STSADM command prompt window. It’ll auto-close. Some final things are executed, such as running the Health Analyzer jobs and launching Central Admin before being complete. After you press a key, the log file will also automatically open in WordPad (by default) and the PowerShell window will close. Review the log for any errors or warnings. Neat! As you can see, my databases are prefixed with SOPS, like I wanted and the default underscore character was used as a separator. Also notice, there are no GUIDs and everything has a nice descriptive name. I enabled pretty much every service and installed everything on one server for demonstration purposes. I’d never advise to do on a production server. Choose your topology appropriately depending on your needs (for example, use dedicated servers for Search and separate servers for Web Servers (WFEs)). Sometimes, you’ll get errors and the script will abort. This happened to me because I didn’t create a MySite, but tried to start the User Profile Service. The script needs both. All you need to do is adjust your settings, in my case I set UPS to false in the XML file and then re-run the script. It will skip the parts that are already done. I do respond there and so do others, so your chances of getting an answer, more quickly, are much greater. New-SPManagedAccount : Account demo.localspservice has already been registered. Why script tries to register manage acount one more time, when it was already doing and dont want skip this part? @ChinaUA It actually *should* skip that part. Many times, I will just start over (unregister the account) or comment out that line in the PowerShell script. Use Remove-SPManagedAccount.